This is a post with different tips and tricks for the new Samsung Galaxy S4. Press and hold the Home button and the Power button, for about one second. The first method is a bit unreliable, as you might touch something on the screen unintentionally, for example start scrolling, and ruin the screenshot. The second method is the most reliable one. Coming from the Cyanogenmod 10.1 on Galaxy S3, I guess Im just a bit spoiled with a separate menuitem on the power menu, for taking screenshots. Press the “Build number” section 7 times. You will then see a message, and the “Developer options” menu item will become visible in the “More” tab! In the developer options menu, you can enable debugging, and start develop and test apps on your device. 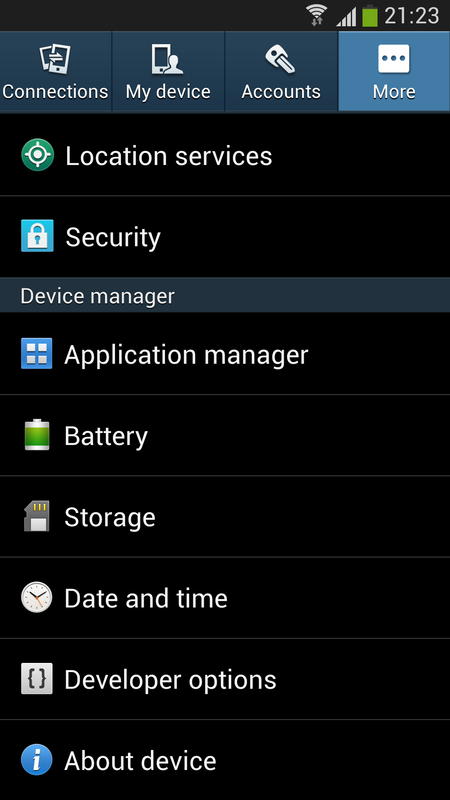 This also works on the Galaxy S3, although the settings menu layout is just a bit different.